This is a short trip to Dubai. Diamond of Gulf. This fanciful harbor with the highest security is known as an international stop point. These days Dubai has direct flight from more than 140 cities. Out there you can enjoy an excellent place for a short vacation, which provides you unmemorable pleasures. Day 1: Arrival in Dubai airport. Meet and transfer. At night cruise on a dhow. Our agent welcomes you, while having the logo of Key to Dubai. Afterwards you will lead to your reserved hotel. each other with large bridges and beautiful subways. Extensions of sea to land which leads to appearance of many ships and boats, make this beautiful old harbor a special fantastic one. Now it’s time to see the city from a different angle, while cruising on a dhow. Dhow is the name of traditional ships of Dubai which have a particular shape and beauty. 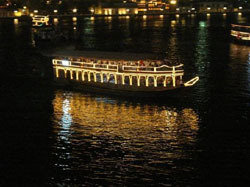 In night tours these dhows which have beautiful adornments, will take you to a short sea trip. 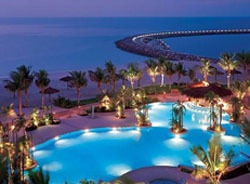 On this nightly tour you will enjoy gulf music, dance and delicious Asian and Arabian foods. Finally you will surely have an unforgettable everlasting memory. Day 2: Dubai city tour. 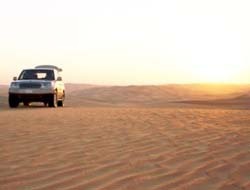 Sahara exploring tour in the evening. A variety of sightseeing and cultural tours are available in either private cars, group convoy and on a double-decker bus. ing, or try out a henna design on hands or feet before enjoying a delicious BBQ dinner and fruity aromas of the famous shisha (Arabic water pipe). Then you can sit back, relax and experience the delights of the belly dancing performance by the campfire beneath the stars (year-round except Ramadan). Day 3: Shopping tour. In the evening visit Jumeira City and take part in the water dance show near Khalifeh tower. photo developing, jewelry, electrical items, clothing and newsagents. There are also 22 cafes cafes, restauranrs and bars. Business guests and couples travelling alone have access to the new stylish club Executive Lounge providing a convenient meeting place offering breakfast, refreshments and sundowners. There’s a haven where executives can hold informal meetings or simply reflect on their day. Near Khalifeh tower there is an artificial lake which every half an hour the music of one of countries is played along with water dance and light dance. This situation makes a desirable and wonderful night for you. Day 4: Morning is free at leisure. Depart Dubai in the evening. PTA, the KeytoDubai. All rights reserved. No part of this site may be reproduced without our written permission.